Address: G/F, 400 Shan Tung St.
Han Heung is a bakery known for their wife cake (老婆饼). They closed their Mong Kok location on Nathan Road but reopened a shop on Shan Tung Street by the Ladies’ Market. Edit on 12.19.2016: This location is now closed! Please check Han Heung’s website for their current locations. 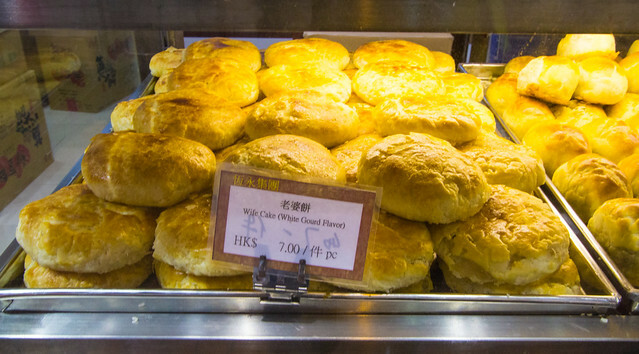 A sweetheart cake or wife cake is a traditional Cantonese pastry with flaky and thin skin made with winter melon, almond paste, and sesame, and spiced with five spice powder). “Wife cake” is the translation of lou po beng from Cantonese, and although the meaning is “wife,” the literal translation is “old lady cake,” paralleling the colloquial usage of “old lady” for “wife” in American English. The origins of the Wife Cake involves the tale of a couple living in a small village in imperial China. And while they lacked material wealth, they had no shortage of love for each other. Then tragedy struck, with the outbreak of a mysterious disease causing the husband’s father to become fatally ill. The couple spent all of their money on treatment to save his life, but to no avail. In the ultimate display of self-sacrifice, the wife sold herself as a slave in order to afford the continuing treatment of her father-in-law. Once the husband learnt about his wife’s actions, he devised a pastry filled with winter melon and coconut in order to buy her back. His cake then became so popular that not only was he able to earn enough to free her, but enough to save his dying father. 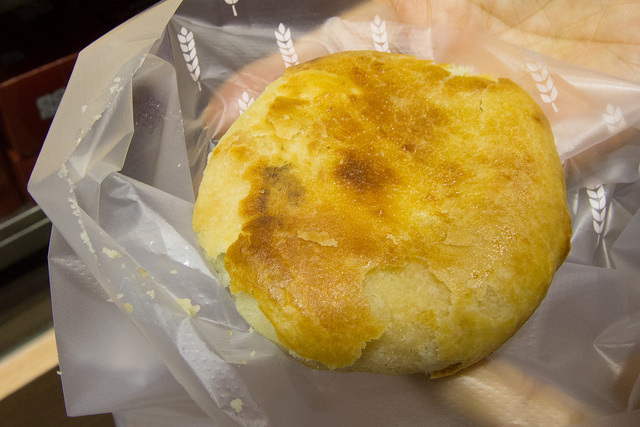 A bun filled with sweet winter melon paste. Legend has it that when the winter-melon puffs made by a woman in Guangdong Province were highly praised in public, her husband proudly declared that there were his wife’s cakes. The name ‘wife cake’ stuck. 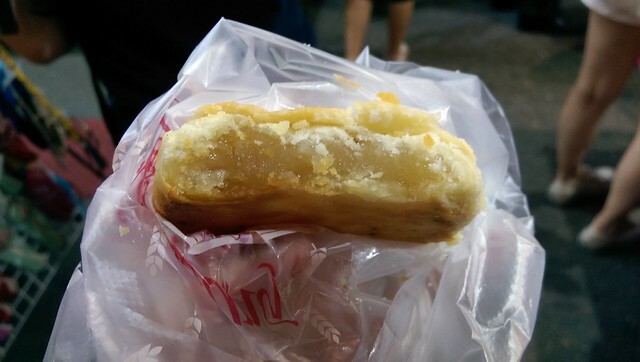 In Hong Kong, back when the New Territories was a day trip away from the urban areas, it was de rigeur for visitors to Yuen Long to buy wife cakes to take home. Today, they can be easily purchased at Chinese bakery shops citywide. A friend and I grabbed a wife cake to snack while strolling down the Ladies Market! Wife cakes are flaky on the outside and are traditionally filled with candied wintermelon (white gourd). Each piece was $7 HKD. Hang Heung’s wife cake was delicious; it’s no wonder many people rave about this place! I dislike wife cakes back at home because the thick crust would overpower the filling. Hang Heung’s crust is thin and filled with plenty of candied wintermelon. I have joined their wife cake class while I was in HK. I think the class was the last class which was organized by Hong Kong Tourism Board then. The fee was less than 10 bucks and really had a great time even I had to visit tourism office near the Star Ferry Terminal and present passport and made a booking there in advance. I enjoyed the class with tourists from UK, Australia together. Lovely memory in HK!